It’s probably unlike me to say this about an election, but wasn’t it incredibly dull! For the broadcasters, it seemed to be an exercise in going through the motions to come to a result that we’ve all been able to predict for weeks – but a slightly more dull, less damaging to Labour result. They might as well have played the results show from the last local election – I doubt anyone would’ve really noticed. 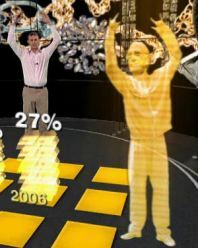 The BBC resorted to bizarre graphics apparently borrowed from The Day Today involving a rapping Menzies Campbell cartoon (‘Ming’s Bling’) and Tony Blair playing virtual tennis, presented by a Radio 2 DJ. I’m all in favour of making these things more accessible – but Ming’s Bling?! ITV were so bored by the story that they didn’t even bother with a special. The only moderately interesting thing about the election is that the SNP have the most seats in the Scottish Parliament. But it’s no majority, they have one more seat than Labour. Again, it’s interesting to see, but only slightly interesting – and less interesting than the prediction of the SNP doing very well. The Scottish elections were a practical disaster, with hundreds of thousands of spoiled ballots and an electronic counting system that didn’t work. That was unexpected, and perhaps there are lessons to be learnt, but it’s hardly the 2000 US Presidential Elections. This 1,119th post was filed under: News and Comment, Politics.